← Fresh flowers and veggies! We spent the day getting ready for our Creekside Market Day tomorrow. We cleaned garlic, picked and arranged flowers, picked herbs and got lots of veggies ready. Come see us between 9 and 2. We will have our tent up in case of rain. Our July Creekside Market is coming up and we’re getting ready. 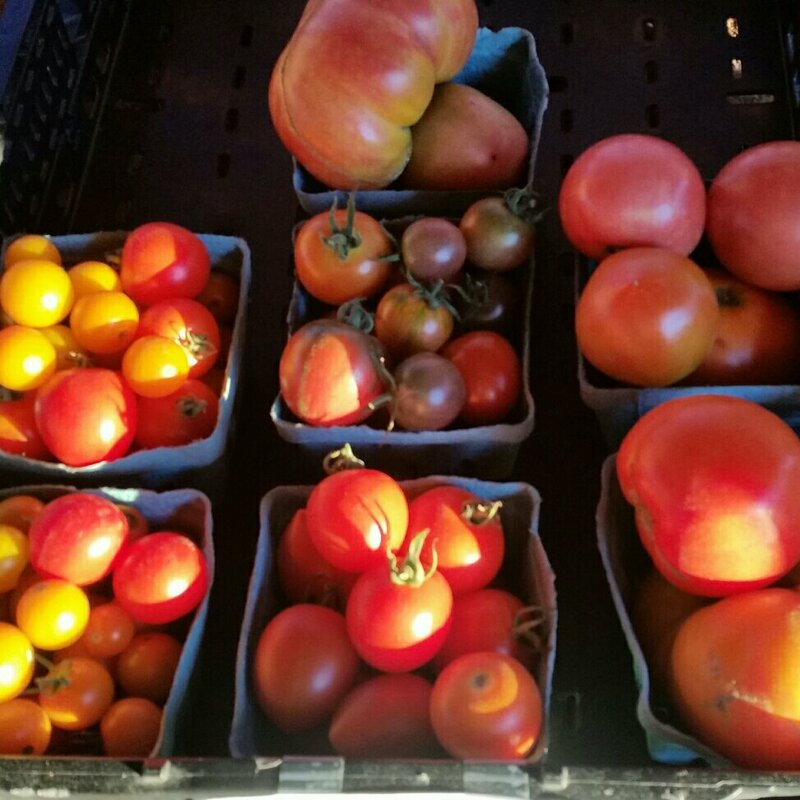 The summer vegetables are starting to come in – tomatoes, beans, peppers, zucchini, eggplant and garlic. We are picking some beautiful flowers, the hens are picking up the egg laying pace – YAY! We will have our regular honey and creamed honey available along with our hand-made goats milk & honey soap. Made here with local milk and our own honey. We will have 2 new “summer” soaps – #1 is our neem soap with Lemon eucalyptus, rosemary and lavender essential oils and marshmallow powder. #2 is cucumber with green tea – made with cucumber pulp, yogurt, green tea powder and some extra special oils – hemp seed and shea butter. We will be in our farmstand from 9am until 2 pm. The stand will be open after that for self service with our regular items – vegetables and eggs. If you are interested in honey or soap and can’t make it during market times – please contact us ahead of coming out. Thank you so much. If the beekeeper says no, then it’s no. We want to keep that honey coming. However, if your beekeeper wants someone to sample the honeycomb to make sure it is fit for sale (hahaha) then by all means allow us to donate our taste buds for the good of the community…lol. I will ask our bee keeper about honeycomb. I asked last year and he said because it was the first year he didn’t want to take it. We were pretty cleaned out yesterday. Bill picked some zucchini this morning and I’m going to check on tomatoes. There is also some swiss chard, garlic, eggplant and herbs in the cooler. Pam, do you have actual honey comb? My daughters have asked to try it and so I need 3 bites or more…lol. And are there any vegetables left from yesterday? Marshmallow root is a skin soothing herb. What does the marshmallow powder in the summer soap do? 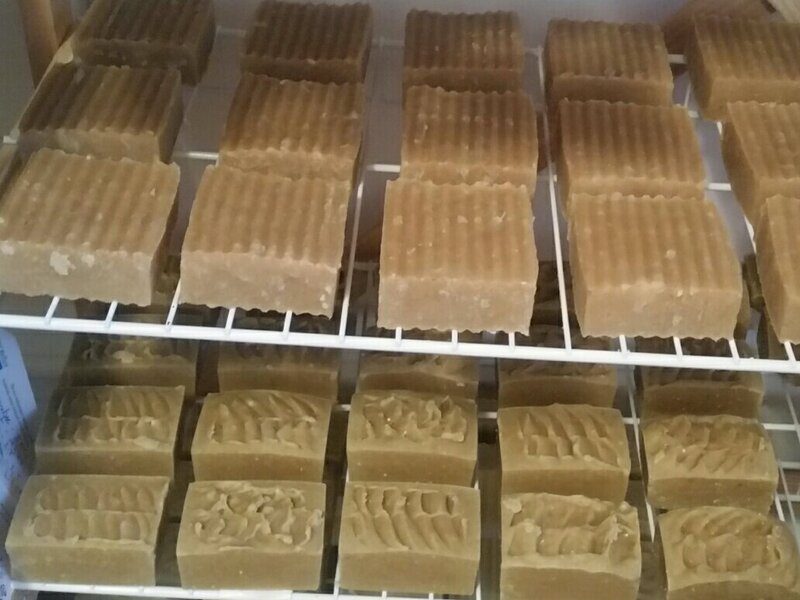 The neem soap is what we use for dog shampoo. Also good for people. Will you have the dog shampoo?